Daughter of Fortune is ostensibly the story of Eliza Sommers. Abandoned as an infant on the steps of the home of an English family in Valparaiso, Chile, Eliza is taken in and raised, sort of, like a daughter by Rose Sommers. Rose lives with her brother Jeremy in the English section of Valparaiso and takes intermittent interest in the girl, who ends up being taught English manners but being nurtured by the Chilean housekeeper, Mama Fresia. The book is also, and I would argue more so, a history lesson on the world of the mid-19th century, from Chile to China to the California gold rush. Author Isabel Allende uses her characters to examine the times, places, and cultures in which she endeavors to place her story. The history is rich and robust, including not only events, but deep looks into culture, habit, and the effects of a rapidly changing world on both the upper and lower classes. The history is meticulously researched and beautifully presented, giving the reader a marvelous portrait of a vast spectrum of experiences during a relatively short span of time. Abandoned at birth, Eliza has no prospects other than those bestowed upon her by the generosity of the brother and sister who take her in. She knows her place and learns quickly to become invisible and lean on the ample bosom of Mama Fresia when she wants something close to a mother. She learns to do all the things a proper English girl should do, but she also eagerly absorbs the earthy knowledge of the peasant servants with whom she spends much of her time. That she becomes an unusual young woman is of no surprise given her unusual circumstances. We follow her from her sheltered childhood through the many adventures of her early adulthood. It is through her that we see the world of both the privileged and the oppressed. She doesn’t really belong to either world, making her ripe to rebel. Jeremy is an employee of the British Import and Export Company and as such was dispatched to oversee their Chilean operations in Valparaiso. Rose, after a scandalous incident in her early adulthood, seems destined to be a spinster who looks after the household of her brother without hope of independence, marriage or any sort of freedom. She sees Eliza as her only chance to be a mother, though she has no real idea what that means and treats the girl much more like a plaything than a child. It is through them that we see the stubborn English aristocracy who believe that they are far superior to those over whom they rule during these days of Britain’s vast colonial empire. John is the absentee brother who is a ship’s captain and comes to visit his siblings with some regularity, bringing gifts for all, including young Eliza. She adores her burly, exotic uncle. It is through him that we see the jaded world travelers of the era and it is his influence that likely leads to Eliza’s fearlessness. Tao is the Chinese cook aboard John Sommers’ ship on one of his many stops in Valparaiso. He was born into abject poverty in China and through extraordinary circumstances finds himself acquainted with not only John, but Eliza as well. It is through Tao that we see China of the 19th century, its reverence of foot binding, its medical traditions, its isolationism and the obstacles faced by its citizens when they leave their country. He also provides a counterpoint to Eliza’s impetuous nature with his patient, cautious approach to this new world in which he finds himself. History is thematically rich no matter how it’s presented. When properly observed and documented, every time and place inevitably exhibits both the best and worst of human nature. Daughter of Fortune chooses to emphasize the vast inequalities between men and women, whites and non-whites, rich and poor. Throughout we see fortunes won and lost and learn about the difficulties of living as anything but a white man in the United States of the Gold Rush era. The haughty imperialism of the British towards the native population of Chile underscores the point as even when vastly outnumbered, white men still maintained full control over a country not their own, as well as over the female members of their families. The meaning of honor is also a frequent and persistent theme. As we come to know the traditional English and Chilean punishments for bringing scandal or dishonor to one’s family, we see that this, too, has been co-opted as a means of control, mostly over women who would defy men. As the story moves from Valparaiso to the north we see many different types of both honor and dishonor as our characters learn to operate outside of their very rigid upbringings. Also close at hand through much of the second half of the book is the notion of the vast wilderness of the American Northwest in the mid-1800s. As our characters begin to experience both the thrill and the jarring violence that comes with lawless freedom we struggle with the idea that rigidity exists in other parts of the world in large part to control the brutal excess that exists without structure. Which is the lesser of two evils – oppressive rigidity or ruthless exploitation of complete freedom? For it seems that for human beings there are few other options. 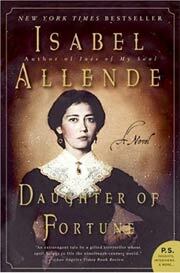 Daughter of Fortune is an extremely readable, very intimate historical novel. We learn about the cultures, adventures, trials and tribulations of our characters in great detail, leaving us with a rich understanding of certain aspects of life in the 19th century. As history, it’s excellent. But it’s also a novel, and as such falls a little short. If you aren’t very interested in history in general, you’re likely to lose interest – the writing is dense and packed with historical details that make it a slow read. The characters are very developed, with meticulous attention paid by Allende to making them historically accurate. In doing so, however, she leaves us with a story that’s actually very thin. The bones upon which she hangs her history lesson are rather scanty and she has the very bad habit of overt and extreme foreshadowing that then takes the place of a complete resolution of her plot points. I don’t want to know the vague fate of a character halfway through the book only to be left hanging as to how they actually get there. I also take issue with the end, which is unsatisfyingly nebulous. Not that such an ending is always bad; sometimes it’s important for the reader to fill in the blanks. Not here. The story is already thin and to abandon the characters without fully resolving those very few tangible story lines feels lazy. I enjoyed Daughter of Fortune, for the most part. I loved the historical depth and accuracy and was willing to follow the meager story to learn more. I was disappointed in that story, however, both in the telling and in the conclusion. 3 stars out of 5 and a recommendation only for those who really like the history part of historical fiction. You won’t find much else here.